One of the most popular pieces from the Anya Hindmarch SS13 collection, the Bathurst bag. Model Olivia Palermo is a huge Anya fan and has already bagged herself one. Alexa Chung has also been seen out and about with her Bathurst. So you can imagine my shock when I saw this bag in the Anya Hindmarch store in Kildare Village Outlet. The Anya Hindmarch Bathurst Bag is both ladylike and functional. 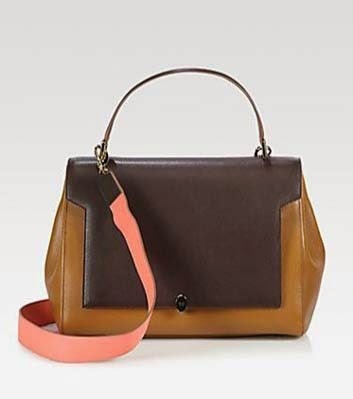 It comes with two cross-body straps - one matching, one contrasting - so you can wear it in many different ways.The gusseted sides and roomy suede-lined interior will ensure you can fit in all the essentials, with room to spare. It also has labeled compartments on the inside for “lipstick”, “sunglasses”, and “phone”. I like a bag that organizes my things for me! The Bathurst bag costs €1700, but as you can imagine with Kildare Village being and outlet, this bag cost me a fraction of that price. Certainly the best purchase I have made at Kildare Village and most definitely a #DayTripToChic. Check out Tara Marzuki's #DayTripToChic video with Kildare Village Outlet.